"Eat a live frog first thing in the morning and nothing worse will happen to you the rest of the day" - Mark Twain. It inspired a book by the name of Eat That Frog! (affiliate link) which I will admit that I've not read, and it also looks as though the Mark Twain connection is not accurate, but I've found that the principle works really well for me. The basic idea is that when you make your list of things to do that day, something that I'm a big fan of doing, there are always going to be one or two things on the list that you don't want to do, and the thought of doing them will make you procrastinate. For me personally, they are things like making a phone call or putting petrol in the car! If you identify these tasks and do them first, then not only have you got them done but it will also give you a boost when it comes to getting the other things done that you need to do. You'll feel as though you've got the day off to a good start and thus feel motivated to get on with everything else. I'm quite an anxious person and can easily get wound up about doing things that I don't want to, which throws off my productivity, and so making myself tackle them first is a concept that really works for me. I've recently been using Trello to organise my life, and I have a detailed daily list of things to do. I also have a weekly list, a short term list and a long term list, and I drag and drop in my daily recurring tasks (like check e-mails, do the washing and so on) and create new one-off ones (like buy a birthday present or post a parcel). When they have been completed I delete one off tasks, or drag the recurring tasks over to the next week. It sounds a bit complicated but it works, and I order my daily tasks to make sure that those 'frogs' are right at the top. When they have gone the rest of the day looks much more manageable. I also use Trello to organise my blogging schedule and you can read all about my system here - How I use Trello as a blogger. I love looking around my house and seeing the things that I've made. Although I love crafting I'm not very good at crafting for the sake of it, I like to make things that are useful and have a purpose (even if that purpose is just decorative!). I thought I'd share some of my favourite crafty makes from the last few years that are still on display and in use. 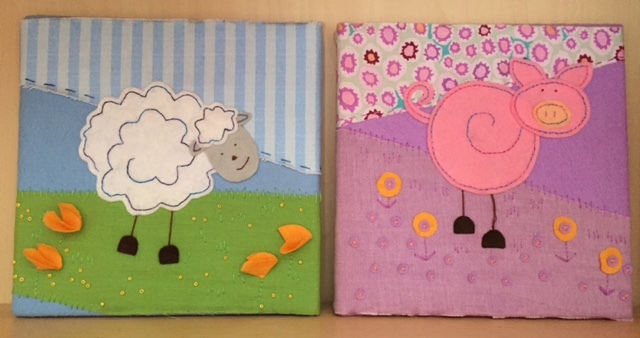 These felt and fabric applique pig and sheep canvases were one of my first 'grown up' crafty projects. I bought them as a kit and made them when I was pregnant with Harry, and they set the theme for his first nursery which was farmyard themed. They stayed in his room until we decorated it with a space theme, at which point they were moved to Mia's room where they still sit on her shelves. To be honest both children have outgrown them now, but I can't bear to get rid of them, I'm hoping they can stay in Mia's room for a while yet! Another crafty project that I was working on when my children were babies is my cross stitch sampler. It's the Three Things sampler by Moira Blackburn (affiliate link) and it is still available to purchase as a kit. I remember that it was an expensive gift at the time, but as it took me around seven years to complete it I certainly got my money's worth! It now hangs in the wall in our study. My drawstring backpack was my first proper sewing machine project following a pattern and I was very pleased with how well it turned out. The bag hangs on the back of my office chair and it's really useful for days when my usual handbag isn't large enough but I don't want to carry around a proper rucksack. Finally, also proudly on display in the study are my decorated wooden drawers from Ikea. These little drawers are so handy, I use them to store odd little crafty bits and pieces and they are surprisingly roomy. I'm thinking that I might need to pick up another set next time we are there, they would be great for storing all Mia's little hair bits and pieces and other junk that she's collecting at an alarming rate, and she'd love to help me decorate them. When I first encountered Marie Kondo and read the book The Life-Changing Magic of Tidying (affiliate link) I was instantly inspired, and I've blogged a couple of times about how I've used her method - my first post about the book and my post about the second book and sparking joy. In a nutshell, if you follow the process detailed in the book, you need to complete your 'tidying' in one go (by which Kondo means over a period of about six months) and you tidy by category in a strict order - clothes, books, paperwork, komono (all miscellaneous items), finishing with sentimental. By working in this order you will hone your skills for deciding what sparks joy - the things that you are going to keep - so that when you finally reach the sentimental items you will be able to deal with them easily. Tidying by category means that when working on clothes, for example, you will make a pile of every single item of clothing that you own, so that you can make decisions about everything within that category at once. I've always been interested in decluttering and aspire to a minimalistic lifestyle, but conversely I'm also someone that hoards sentimental items and memorabilia, keeping memories alive through old diaries, ticket stubs, postcards and old toys. This has meant that I didn't find it necessary to follow the book strictly as I was already pretty well on top of clothes, books and paperwork. So it was really the komono categories that I needed to think about. Kondo is very clear that you must complete your tidying in one go. You will be able to maintain your decluttered space, having become more aware of your possessions, and having learned to pass them on when they are replaced or have served their purpose. However with small children around I've found that going through things regularly is essential, and I still need to use the 'pull it all out at once and go through it all together' method. In particular I have found this with their clothes - even though the children are growing more slowly now I am still astonished by how quickly the outgrown items pile up in their wardrobes. I find that packing for a holiday is a good time for a sort out and I will pull out all their clothes, pick out the ones that I need to pack, and think carefully about the clothes that I'm putting back in their wardrobes. It's not so much about which clothes spark joy as the ones that still fit them. Toys are another area which I need to constantly keep on top of. The children are constantly acquiring new small toys and other bits and pieces from party bags, freebies from magazines and so on, and I'm also lucky enough to receive occasional deliveries of toys and craft materials thanks to my blog. And of course the types of toys that they want to play with changes as they grow up. When it comes to toys I'm afraid that I do deviate from Marie Kondo's rules. She suggests that children from the age of three or so should be involved in making decisions about their possessions. However I've found from experience that while mine get very upset at the thought of passing things on if they can physically see them go, they very rarely miss anything that has gone and are very comfortable with me talking about the idea of passing things on to other children once they have finished with them. For me personally, the biggest takeaway from the books is learning to love and appreciate your possessions rather than stuffing them away in cupboards and drawers. I wrote more about this in a recent blog post - My Marie Kondo approach and sparking joy - and I'm really learning to love my home surrounded by the things that make me happy. Are you a Konvert? What have been the most and least important messages from the book for you? I love reading about what other people have taken from the books! Header photo credit - Irene van der Poel via Unsplash. Today I'm sharing a really simple activity that kept both my children busy for ages after school the other day - making garden mandalas using natural materials found in the garden. It's so easy to do, and you don't need to have a big garden with lots in it - generally the only flowers that I cultivate are daisies and dandelions! Of course it's also a great activity for when you are out and about - at the beach, in the forest or anywhere really. If you want to give your children some inspiration to get started just do an image search for garden or natural mandalas, and you'll find lots of examples to give you some ideas. I gave the children an old plate and some chalk to draw around it to give them a basic template to work with, as well as a few shells, but they didn't need much help to get started. It was such a fun, relaxing activity that I couldn't help but take part myself. And although Mia didn't have the same patience for it as Harry, she still made a pretty good attempt, and it sparked an interest in making mud pies as she went on to mix up the flowers and stones that she had collected into various potions. It's a bit of a shame that it's such a transient art form and they don't last long, but at least it's easy to take a quick photo of the finished work before it blows away! This week Harry has been spending a lot of time reading Explore 360: The Tomb of Tutankhamun (affiliate link) , a fantastic new book from Carlton Kids. Although the book is focused around the tomb of Tutankhamen and its discovery, the book begins with plenty of information about all aspects of ancient Egyptian life to help put it all into context - for example the geography of the area, the pyramids, the Valley of the Kings as a whole as well as other famous temples, along with details about everyday life at that time. There are a couple of brilliant double page spreads, one about how mummies were prepared, the different ceremonies and rituals, and what the ancient Egyptians believed happened after death, as well as one showing some of the objects and wall paintings from the tomb. Harry loves these pages! When the book moves on to dealing specifically with Tutankhamun's tomb there is a huge amount of detail, but as there are plenty of photos and illustrations along with easy to access blocks of text, Harry lapped it all up. The story begins with the search for the tomb, some information about Tutankhamun's life, all leading up to the exciting moment when a hidden staircase was discovered. The book takes us through what was found in each room, how it was all excavated, and where the treasures can be found today. A great feature of this book is that it has an accompanying free app. Once downloaded you can explore Tutankhamun's tomb by moving your tablet around and zooming in for a closer look at some of the objects inside. It's really good and helps bring the tomb to life as well as helping to get a feel for the size and scale inside the tomb. The book also links to the app, with notes to tell you whereabouts you are located in the tomb as you read each page so that you can explore through the app at the same time. Ancient Egypt and the tomb of Tutankhamum is an absolutely fascinating subject to explore and this book has really sparked Harry's interest - we've been watching lots of videos about the tomb and he's been looking through the photographs from when Ram and I visited the area a few years ago - the book is definitely going to be a bookshelf staple! What do you bring home from your travels? Recently I read this great blog post from Fizzy Peaches - How to buy souvenirs on your travels that aren't tacky - and as a frequent traveller it made me think about the souvenirs and mementos that I bring back home to remind me of our holidays. We aren't really big ones for buying things on holiday. A good thing when it comes to not having a house filled with tat, but I do sometimes see other people's houses with reminders of the places that they've visited on display and wish we had a little more. As a child I didn't hold back though, and over the years travelling with my family plenty of tat came back with me. Not much of it remains now, but I do have a few things that I like to keep around. The little decorative plate in particular I vividly remember buying after visiting some caves in France, I've no idea why as I've never had any others like it before or since, but something about it must have appealed to me at the time. I think that the little cat must also have come from France due to the beret and I can't remember the origin of the shell mouse but he's very sweet! I also bought these pottery candlesticks years ago on a family holiday somewhere hot and sunny. They don't match the decor anywhere in our house so I don't keep them out on display, but I bring them out when we have special meals and put them on the table. I love them! When Ram and I first started holidaying together I decided that I would start to collect magnets, trying to find the most hideous and brightly coloured ones that I could. In our old house they were stuck to the front of the fridge, although unfortunate close proximity to the recycling box and a toddler meant that a few went missing over time. Our new house has an integral fridge with non magnetic door which is probably a good thing, so instead my remaining magnets are stuck to the magnetic backing on my desk holding up some favourite postcards. More recently, when we go on holidays that involve a beach, I've been looking for sea glass (I hit the jackpot in Barcelona!) and interesting shells and pebbles. I have a big box full and no idea which individual beaches they all came from, but I like seeing them all jumbled together. Finally the thing that I collect the most from holidays is paper - leaflets, guidebooks, pamphlets, postcards, tickets, maps...I have two boxes in the top of my wardrobe stuffed with paper souvenirs from all our trips. It's handy to have maps in case we intend to visit somewhere again (although in the days of Google maps they are pretty well redundant) and I love going back through the boxes and reminiscing. This year in the UK Father's Day will be celebrated on June 19th. It's lovely to give Dad something homemade for Father's Day, especially if it's something that he can use or put proudly on display. We received a selection of crafts from Baker Ross which would be lovely gifts for children to make for their Dads. Firstly I love these Elephant Ceramic Coin Banks. They are really easy for young children to paint, and older children can come up with more intricate decorations. To paint them we used HobbyLine Brights Porcelain Paint Pots which are fantastic paints that we've used for quite a few projects. They cover nicely and come in some lovely bright colours. This coin bank is a practical gift that would look great on display. Next we used the same paints to decorate some Wooden Beach Hut Key Holder Kits. Again the paints covered well and dried to a lovely shiny finish. Mia painted the beach huts herself and I think that she did a brilliant job! Then we decorated some Wooden Keyrings. The keyrings come in lots of different styles, and I think that they are a great price. Mia chose her favourites to paint and then finished off with some felt pens, Ram is always mislaying his car keys so hopefully these lovely keyrings will help him to keep track of them! Finally Baker Ross sell some Self Portrait Blanks which I'm planning to work on with the children nearer the time. They are cut out shapes that the children can use to make their own portraits and I think they'd be fab for a group of children to work on together - you could ask them to make a portrait of their Dad for a great display! Once again we had a lot of fun with these Baker Ross crafting kits! This month the theme for our Bostik Bloggers craft was weather. Mia is obsessed with the weather and still loves the weather dial that we made last year, so I was looking for other ways that we could represent different weather types. With the weather having turned so nice lately we've been spending a lot of time in the garden and our summerhouse, and so we decided to make some more bunting to decorate the summerhouse with a weather theme. First decide what types of weather you want to include - we went for snowy, sunny, cloudy, rainy, thundery and windy. Choose which coloured cardboard you want to use to represent each type of weather and cut out your bunting triangle shapes - we used a bunting template from Activity Village and cut it down slightly. Sort out your decorations so you know what you will be using for each triangle. Then type out and print your different weather types so that they can be glued to the top of each bunting piece. Mia is getting on really well with her reading and writing so I helped her to type the words out herself. When decorating the triangles make sure to use plenty of glue for the heavier items such as buttons. We used the Bostik Fine & Wide Glu Pen which is brilliant, the sides are easily squeezed so Mia can use it herself easily, it dries clear, and it sticks everything down firmly. I've also found Blu Tac Glu Dots to be excellent for sticking down pom poms. Leave the decorated triangles to dry thoroughly, then punch a hole in the corner of each one for hanging. Thread the length of ribbon through the holes, making sure to leave plenty at each end to make it easier to hang. Decide on the distance that you want to leave between each flag, make sure that the ribbon is lying flat and neat, then use a piece of tape to attach the ribbon to the back of the flag firmly so that it won't slide about. Then decide where to hang your bunting! Ours looks fab in the summerhouse, and it's really easy to hang as I just stick drawing pins into the wood. I've been doing a bit more of a Marie Kondo declutter lately, and inspired by her second book Spark Joy, as I wrote about here, I've been concentrating on finding the things I have that spark joy, and making sure that they are on display in my home. I've discovered that some of the things that definitely spark joy for me are bowls, I have them everywhere! I've made an effort to move them to places where they can be more easily seen, and fill them with pretty things that look nice on display and are also tactile - I can run my fingers through the contents whenever I pass by! Many of my bowls have congregated in the bathroom, because I have a couple of sets of small open shelves and I don't like them to be cluttered up with ugly bottles of toiletries. I have owned this colourful, shiny, daisy bowl for ages since I bought it on a family holiday many years ago. It used to live by my bed and now it is on the bathroom windowsill. It doesn't have much in it, because the pattern is continued on the inside and I like to be able to see it. This wooden bowl was bought for my by my parents from one of their holidays. It's filled with some stones that I picked up on a beach, somewhere on the south coast. I remember that they were pebbles that looked really pretty when they were wet on the beach but they lost their lustre somehow when they dried out...I still like them though! I had to move them away when I had toddlers around but I can keep them back out now. My final bathroom bowl came from my Grandma's house and I'm pretty sure that she or my Grandad made it. It used to live on my bookshelves, again high out of toddler reach, although I used to get the marbles out for Harry to play with under close supervision. They are mainly pretty metallic marbles so they have a lovely sheen to them. There are also some clear glass pebbles that I've collected from various crafty endeavours. The orange stone in the middle is a worry stone that I remember my Mum buying for me when I was little. It's shaped to fit between your fingers, and turning it over and over is supposed to alleviate worry. It's new position next to the sink means that I can pick it up whenever I'm in the bathroom! This pottery bowl also came from my Grandma's house. Until recently it was empty and hidden away on the bookshelf, but I found it when I was sorting out the shelves and moved it to the front where I can see it. I recently went through all my beads. I put the large plastic ones aside for Mia to thread, the plain ones are in my craft drawers, and I used this bowl to store all my prettiest beads where I can see them. There are some in there that I have in mind to use on my Sky Blanket and some that I will probably never use for crafting, I just like to keep them! Finally I've had the little plastic bowl below for a long time too, I don't remember where it originally came from, but a bit of Googling shows it to be a London Beetleware pudding bowl, dating from around 1930. It's mottled blue and white and very pretty. I use it to display my sea glass collection which was mainly picked up on the beach in Barcelona. The bowl sits on the shelf next to my desk, and if I'm feeling uninspired I move it in front of me and pick out the pieces of glass and feel their smoothness while I'm thinking. Do you use bowls as part of your decorating? What do you keep in them? Drusillas Park in East Sussex is somewhere that holds many fond memories for me. I remember visiting with my family when I was little, and we've also visited a couple of times with the children - you can read my previous review here. Last week we were invited back to see what's new, and we had a brilliant day out! A visit to Drusillas starts with the Zoo. 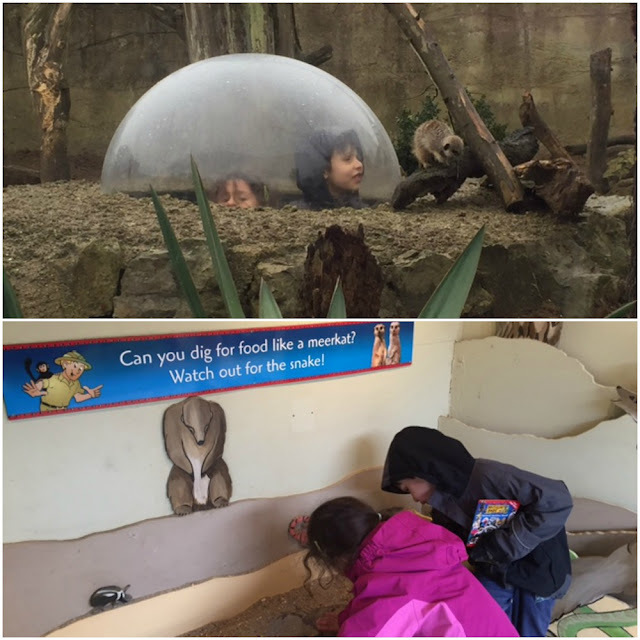 You follow a clearly marked route through the varied animal enclosures, including which include monkeys, bats, penguins, red pandas, owls and flamingos. The zoo is beautifully presented, lovely and clean, and with plenty of information about the animals. At the entrance you can pick up a couple of fun little books that you can fill out as you go around. The Animal Spotter Book has pictures of twenty different animals that you will find at Drusillas. As you spot the animals you can find the close by stamping station and stamp the box. Even very small children are able to take part, and both children loved doing this, it also makes a nice souvenir to bring home with interesting facts about the animals that you have seen. You can also collect a Zoolympics record book and take part in the Zoolympics Challenge, then if you complete the whole book you'll receive a certificate. We just took part in the challenges as we spotted them and they were a lot of fun, seeing how high you can jump, how fast you can run, how long you can stand on one leg and so on, and then comparing your results to different animals. These activities are both a fantastic way to get the most out of the visit, and especially if you have children that get impatient quickly it's a good way to get them to slow down and not rush through. When it came to the animals, our two probably liked the Meerkats the best. You can crawl through a tunnel and pop your head up in the middle of the enclosure for a really close up view, and there are additional activities like hunting for meerkat food in a tray of dirt. On your way through the zoo you catch a few tantalising glimpses of the Thomas the Tank Engine train as it passes by, and so that's where we headed for next. The Thomas the Tank Engine Experience is a lovely little ride through the park, passing some of the animals, including the penguins and llamas, as well as having lots of familiar faces from the Thomas stories to spot along the way. You can ride as many times as you like, and we didn't have to queue at all. When Thomas is at the station you can also stop to have your photo taken in front of him, although the children weren't sure about standing in front of him even though they could see the driver on the platform! One of Harry's favourite areas of the park was the Eden's Eye Maze. It's a really fun interactive maze, not too difficult so you won't be getting lost, but you will want to explore all the different paths so that you don't miss anything! There are lots of sensors which make things happen as you go past or touch things, and make you jump if you aren't expecting it! Harry enjoyed trying to work out the clues to find his way to the centre, and they both loved the two-way mirror where you can watch your fellow guests pulling silly faces without knowing that you are there watching! When you've finished you can climb some steps and see the whole maze from above, which Harry found fascinating. Mia's favourite area was the Hello Kitty Secret Garden. 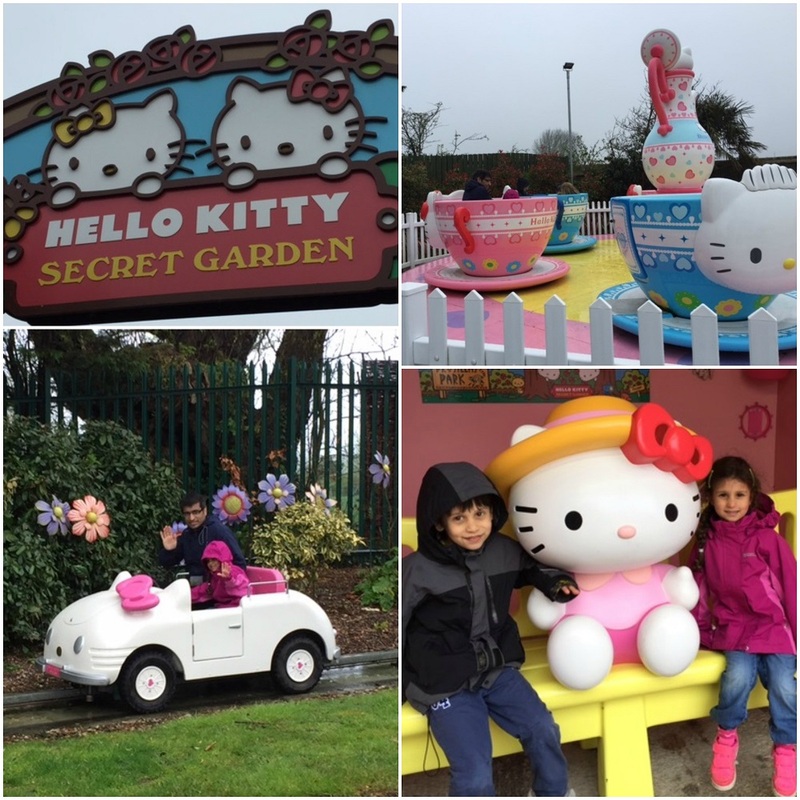 It's a pretty corner of the park with three themed rides that take you through Hello Kitty's world. It was a quiet day when we visited, and we were able to walk straight onto all the rides with no queue. Both children loved the Hello Kitty Car Ride, Mia was convinced that she was driving the car herself and went round and round over and over. Harry is a bit timid when it comes to rides but Mia had a great time on the Tea Cup Ride and the Hopper Ride, I think that she could have stayed here all day! On certain days throughout the year Hello Kitty makes appearances in her Secret Garden. A new area at the park for 2016 is the Get Wet Splash Pad Experience. It was a cold drizzly day when we visited and so it wasn't open, but I can see that in the summer it will be great fun for little ones, and they definitely will get wet! Another highlight at Drusillas is the large indoor and outdoor play areas. It was a bit cold for us to spend much time outdoors (although lots of hardier families were out there having fun! ), but the children had a brilliant time in the Amazon Adventure indoor soft play area which is really big with some long slides. Although I couldn't see everything that they were up to as these days we tend to leave them to it, it was enough to keep them busy for ages! The cost of entry includes admission to all the main areas of the park but there are some activities which cost extra such as Panning for Gold and a Dino Dig. They are placed around the edge of one of the outdoor picnic areas, but we knew they were there and so we just avoided them, I think there is plenty to do without needing to pay any more. There are lots of places to eat your picnic around the park, both grassy outdoor areas and covered tables and benches. We always take our own food on day trips, but there seemed to be plenty of options when it comes to buying food and drink. 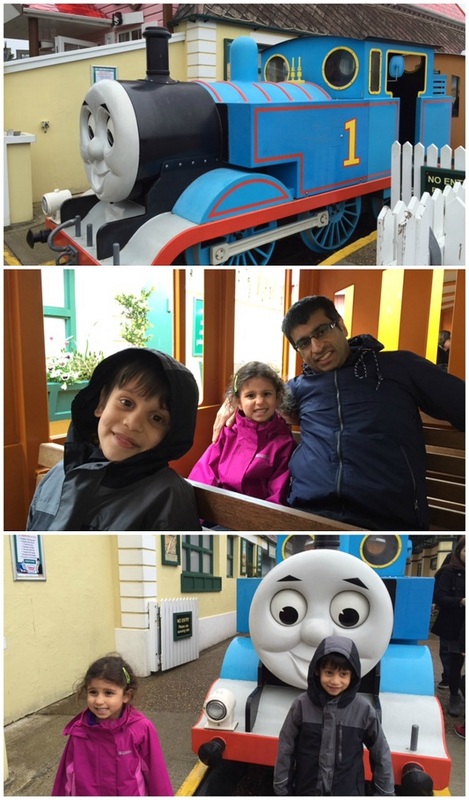 We had a great day at Drusillas, there is a lot to do for children of all ages and I'd really recommend a visit! We were provided with complimentary admission to Drusillas in exchange for this review. A family ticket would have cost us £72 (peak price as it was a Bank Holiday, an off-peak day would have been £68 and if you can visit off peak during the week it's just £54 for a family ticket - see all prices here.) I think it's a reasonable price for a full family day out, especially if you are like us and take your own sandwiches and avoid the extra activities and gift shops! We've already celebrated Mother's Day in the UK this year, but today is Mother's Day in the US and so I'm sharing an infographic showing the various traditions around the world for Mother's Day celebrations (click to view larger size). Mother's Day is celebrated throughout the year around the world, for example in Serbia and the Philippines it doesn't take place until December! It's an important day wherever you are, and as well as being a day to spend time with your Mum there are lots of other traditions. For example in Ecuador, sons will stand outside their Mother's door before sunrise to serenade them with a guitar, and in France mothers are given a cake that looks like a bouquet of flowers! Infographic supplied in collaboration with Families Worldwide. 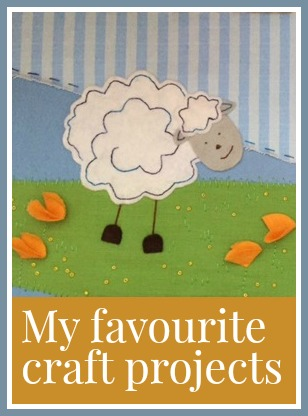 Welcome to Month 4 of the Crafting is my Therapy Linky, hosted by myself and Me, You and Magoo! This month my Sky Blanket continues to progress well, I can't believe I'm a third of the way through (and it really is going to be huge when it's finished!) I really like having something that I can work on each day and because the blanket isn't too wide I can easily do a row each day, although sometimes I save it to work on several days at once. With my granny square blanket finished I've started on a new crochet project which is yet to feature on the blog. It's crochet bunting from Attic 24 and you can purchase the kits from Wool Warehouse - I chose the pink bunting pack but it's also available in blue. I can make up the triangles quite quickly so I'm trying to slow down a bit, I don't want to finish it too soon! I've been a little distracted from crafting this month as I've been working on having a bit of a tidy up and sort out in the home. The result has been that I've rediscovered a lot of old sentimental things that I want to display somehow. I've been putting my favourite photographs and postcards on display, but I've ended up with a collection of old tickets and so on that I want to do something simple and crafty with, I'll keep thinking, and see what I end up with! In a few weeks we are lucky enough to be setting off on our fifth cruise - a week long cruise on the Disney Magic through Norway. Our first cruise was with Harry when he was about 20 months old, and having cruised three times since with both small children in tow, I thought I'd share a few tips for cruising with pre-school aged children! 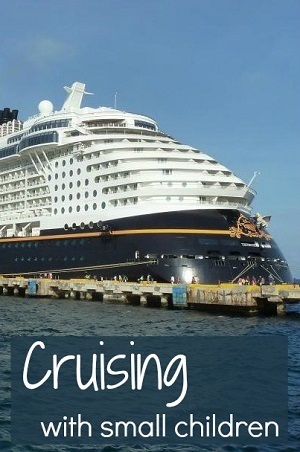 My personal experiences are from cruises with Disney Cruise Lines and Royal Caribbean, both in Europe and the Caribbean. Firstly you need to think about what to pack. Although there are shops on the ship and you will be able to shop in port, things will be more expensive and may be different brands than you are used to. Make sure that you have plenty of nappies and other baby essentials, and also think about taking toddler sized cups, plates and cutlery to use on board ship. Pack some familiar snacks and drinks, and plenty of hand gel. It's also nice to take some bath toys that children can use in the swimming pool - children in nappies will likely be limited to a small splash pool so it's more fun to have something to play with. One thing that we've struggled with is dining on board. It perhaps doesn't help that our children are quite fussy with their food, but I think that most toddlers would struggle to sit still for a full three course meal in a formal setting. For our first cruise we took lots of stickers and colouring books for Harry and rode it out, but of course on most of the large cruise ships you don't have to eat in the main dining room at all and it's often easier to stick to a buffet restaurant. If you do want to eat in the dining room, it's best to book an earlier sitting as there will be more children around and you can make the most of the early evening entertainment before the children get too tired. If you eat in the buffet, sit as close to the food as you can, you'll be constantly up and down getting more food for yourself and the children! When it comes to washing your children, some staterooms only have a shower which was a bit of a problem for us as neither child particularly likes them. I've heard of people taking a small inflatable bath or paddling pool to use in the bathroom. Take advantage of the many opportunities to have your photo taken! We have some really lovely family photographs which were taken on cruises of us all dressed up in nice clothes, and we rarely otherwise have family group photographs taken. They aren't cheap to purchase, but compare reasonably to having a family photo shoot at home, and if you have lots taken there will definitely be some nice ones to choose from. In our experience we've found that stateroom storage, even in smaller rooms, has been more than adequate. The beds are generally quite high, so you can stow suitcases and pushchairs underneath and there will be drawer and hanging space. Some people find it useful to take an over the door shoe hanger or similar for extra storage of small items that you need frequent access to. Be aware that if you need a cot in the room there won't be much floor space left over. Your stateroom attendant should be able to pack it away for you during the day, but if you have a little one that naps or goes to bed early it is more convenient to have it set up permanently. A safety tip if you have a room with a balcony - although the railing is very high and children won't be toppling over, we found that the first thing my son did when he went onto the balcony was to head for the small outside table so that he could climb up on it and look over! Obviously we were right there and he didn't make it, but it did worry me and I barely let them out there after that! The doors are very secure with high up locks so children can't open them themselves, but you do need to be alert, and the same goes for up on deck, as there are always sun loungers and small tables that adventurous children might try to climb on to see over both exterior and interior railings. If your children are old enough and want to go to the kids clubs they don't need to stay for a whole day or even a whole session, you can just drop them off and pick them up whenever you want. Ours have never been huge fans of the kids club to be honest, but have been quite happy to be dropped off for half an hour or so just for a change of scene on sea days, and to let us grab a quick child-free drink or snack or venture into the adults only areas of the ship! You will probably be sleeping in very close proximity to your children, so take earplugs if they are noisy sleepers. The staterooms get very dark at night, especially if you have an interior stateroom, so it's worth taking a small nightlight, otherwise you'll be sleeping with the light on in the bathroom and the door ajar. Check what type of sockets are going to be in your room. In our experience staterooms are fitted with both US and European (2 pin) sockets, so if you have both you'll be able to use more sockets. The rooms are pretty well soundproofed so you shouldn't need to worry if you have a child that wakes up frequently in the night or tantrums. The stateroom doors are magnetic and particularly on the Disney cruise ships it's a big thing to decorate your door with appropriate decorations and perhaps your family names. On our Disney cruise there was a family crafting session early on with art materials to make your own, and this time I'm planning to make decorations with the children in advance, particularly as Mia will be celebrating her birthday while we are on board. Another big thing on Disney Cruises is taking part in fish extender exchanges where you can arrange with other families to swap small gifts while on your cruise - you can find lots more information here - Disney Cruise Line Fish Extenders information. If there are going to be themed nights on your cruise then go prepared with costumes and accessories otherwise you'll likely end up buying them on board for vastly inflated prices. This has been more appropriate for our Disney cruise, with a pirate night and various opportunities for little ones to meet their princess heroines while wearing a matching dress. There will be at least one formal night on your cruise too, and although the dress code is more relaxed for little ones, it's nice to dress them up if you can. Our children have never been good at napping, which is a problem if we've wanted to keep them up a little later in the evening, but we've found that a few laps of the deck in a pushchair often sent them off to sleep, so it's worth taking a pushchair for that even if they don't use one otherwise. If they do drop off it also gives you a chance to sit out on deck with a book and enjoy some peace and quiet! 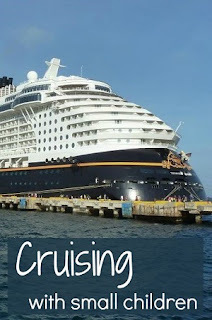 We've had brilliant cruises with our little ones and so I hope that this post inspires you to try it out yourself, or perhaps offer some advice if you are already booked. Do you have any tips that you would add, or any questions? Please do share in the comments!